Unless you're a bit of a world traveler with several stamps on your passport to Japan, or are someone who frequents bigger U.S. cities, like New York or LA where chefs have reached peak ramen experimentation with things like ramen fries, ramen egg rolls, and ramen hot wings, your experience with the Japanese noodle-based soup dish most likely comes by way of a block of dried noodles wrapped in a plastic satchel accompanied with a spice pack found on the bottom of grocery store shelves. Forget momentarily the desire of some chefs to make something as simple as a boiled egg not a boiled egg with Frankenstein trials behind their kitchen doors to remember that there remains a basic but fundamental continuity between both the artful and commercial approach to ramen: The slurping devouring of savory broth and slightly chewy noodles. Which now is being adroitly approached by Executive Chef Dan Kern and company at 1201 Kitchen – and is far, far better than what you may have been used to nuking in your college dorm room. Known for their contemporary take on Asian and Latin cuisine, 1201 Kitchen is now dishing out both distinct and traditional takes on ramen by way of its intended origins: Salty soup built from the broth up. 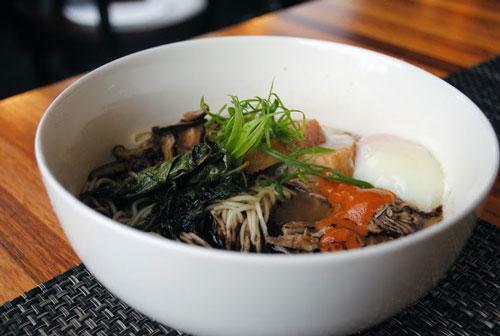 Typically pork- or seafood-based, a rich, luscious broth serves as the backbone and foundation of any good ramen. From there, the canvas of this Japanese art is framed in with wheat-based noodles, which most often are thin or wavy. Beyond that, the ramen palette remains largely open to fresh experimentation while certain interpretations pay homage to the regions from which they hail. 1201's Sapporo ramen harkens to its roots – named after the capital of Hokkaido, a city celebrated for its ramen – featuring a piquant red miso broth richened by the roasted chāshū pork shoulder that's rounded out with bean sprouts and corn – yes, corn, an ingredient most likely introduced to ramen after the arrival of U.S. soldiers during WWII – for a pleasant crunch. Other 1201 ramen dishes benefit – to a carnivore's delight – from intense meat flavor combinations, like the Kumamoto ramen, which features a pork bone-based broth, crispy pork belly, and roasted chāshū pork tempered by shiitake, mayu garlic oil, pickled mustard greens, and scallion. Already known for being innovative without bending food to the breaking point of near-absurdity (read: ramen hot wings), 1201 serves a deliciously sound variation to mostly meat-oriented ramen by way of the vegetarian option, stocked with a sweet soy-milk broth and loaded with soft tofu, mustard greens, pressed garlic, shiitake, mayu garlic oil, and scallion, with the mushrooms – which are more subtle and subdued in the Kumamoto dish – giving it a surprisingly brawny boldness as a key feature. Unlike Vietnamese pho, a noodle-based soup that offers diners the chance to construct their own experience by adding various ingredients from a plate placed in the middle of a table, ramen often comes to the table mostly completed by the chef's rendering of the canvas and the chosen materials; 1201 is no exception. But the menu does allow for eater-driven creativity with the option to add extra noodles, seasonal pickles, a soft-boiled egg, pork shoulder, and pork belly to any menu item – yes, even the vegetarian bowl, because, well, why not. Each bowl is available in full or half-size, the latter option leaving room for any one of the well-paired appetizers, amongst which various – and oft rotating – takes on donburi (a traditional Japanese rice bowl dish that focuses on the resulting interplay between a protein and vegetables served over rice) stand out. 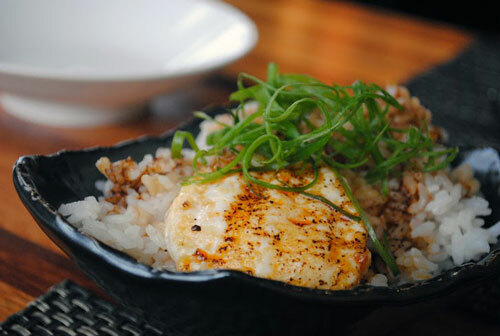 The crispy fried egg version offers a spicy bite – from chili oil – calmed with the silky texture of the soft egg, creating a harmonious balance of savor and spice softened by the sticky bed of sushi-style rice. 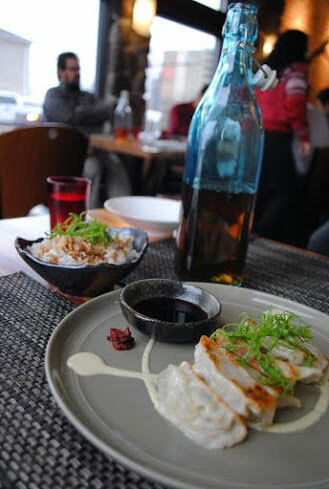 The simplicity coupled with creativity of the ramen at 1201 has brought the Japanese tradition to Erie – and with an authentic yet novel approach, here's hoping that this soulful satiation is here to stay. The Reader Eater can be contacted at ReaderEater@ErieReader.com. More information on 1201 Kitchen, which is located at 1201 State St., can be found at 1201Restaurant.com.